he was that, but eloquent and hilarious." "He was like something waiting to happen...a very powerful anomaly." and he worked on every level." 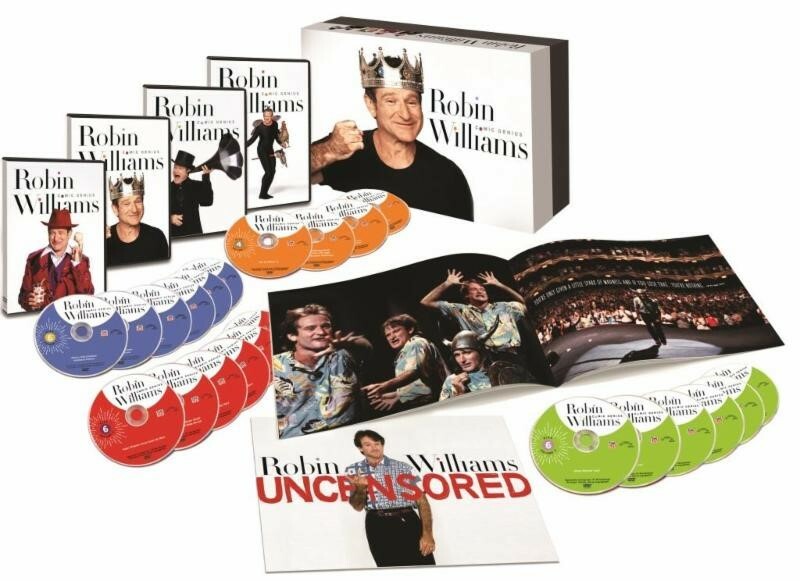 Across 22 DVDs and 50+ Hours, the Electrifying Comic Lights Up the Room in This Ultimate, One-of-a-Kind Compendium Spanning 40 Years on TV, Including All Five HBO Stand-Up Specials Together for the Very First Time, Never-Before-Released Performances and Backstage Footage, Talk Show and Late Night Appearances, Rare Archival Clips, Brand New Interviews Featuring Billy Crystal, Steve Martin, Jay Leno, Martin Short, Pam Dawber, Lewis Black, and Zak Williams, a Collectible Memory Book Featuring Archival Photos, Robin's Tour Notes, and More! Robin Williams was a generational talent, graced with comedic brilliance, rapid-fire improvisation, and a deep well of warmth and compassion that translated to every role he inhabited. From his breakout role in ABC's Mork & Mindy to his Academy Award®-winning performance in Good Will Hunting, the iconic actor displayed an inimitable artistry that made him beloved by millions. This September, join Time Life, in conjunction with the Trustees of the Robin Williams Trust, in celebrating the incomparable career of the singularly innovative actor with ROBIN WILLIAMS: COMIC GENIUS. "Robin Williams: Uncensored", a collectible 24-page, full-color memory book featuring rare, archival photos from award-winning photographer Arthur Grace, reminiscences from friends and colleagues, Robin's personal tour notes and more. 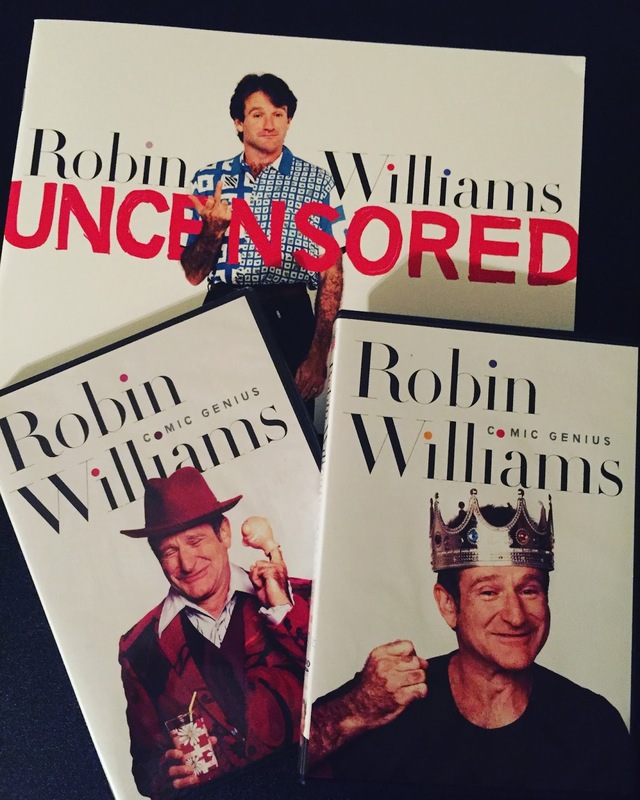 Uncensored, electric, intense and unfailingly hilarious, Williams made it his life's work to make people laugh--whether he was holding forth on culture, politics, the human body or drugs--with razor-sharp wit and insight. As his long-time friend Billy Crystal said, "In the 40 odd years he was in front of us, especially on television, he never let you down. He was always funny, he always did something new." And, in unforgettable ways, ROBIN WILLIAMS: COMIC GENIUS reveals and celebrates the wide range of his incredible talents like never before. I reviewed these two DVDs and loved every single minute. Robin Williams was truly a one of a kind comic who hopefully realized just how special we all found him. From the moment I watched the first DVD to the last moments of the last, I smiled, laughed, even teared up at the loss of one of my favorite comics. Robin is all Robin on these 0-60 in a second. One moment telling a joke, the next climbing up to the second level of an arena "Is this booth okay Mr. Lincoln?" He was funny, witty, vulgar, inappropriate, adorable and we loved him for it. In these DVD's you get some of his stand up routines, interviews, concerts, behind the scenes and more. One of my favorite moments was seeing Robin and John Ritter improvise during his first HBO special. Definitely a crowd pleasure. The set also comes with a color booklet featuring quotes and photos of Robin including his tour notes, USO Tour photos and candid shots. He is a comedian who paved the way for so many others. He could do it all and if you were a kid growing up in the late 70s and didn't have a crush on this hairy armed, colorful suspender wearing, adorable blue eye'd boy with the longish hair you weren't my friend. I adored him. I love that this DVD is available to celebrate the life of Robin Williams and remind us why we were all so devastated at his tragic end. This is a must have and three friends have asked to borrow it from me when they saw me posting it on my private social media accounts. We all loved him and I am left with his quote from 1978 "It has been a privilege kind of pollinating here in your garden. Come back, I'll be here."